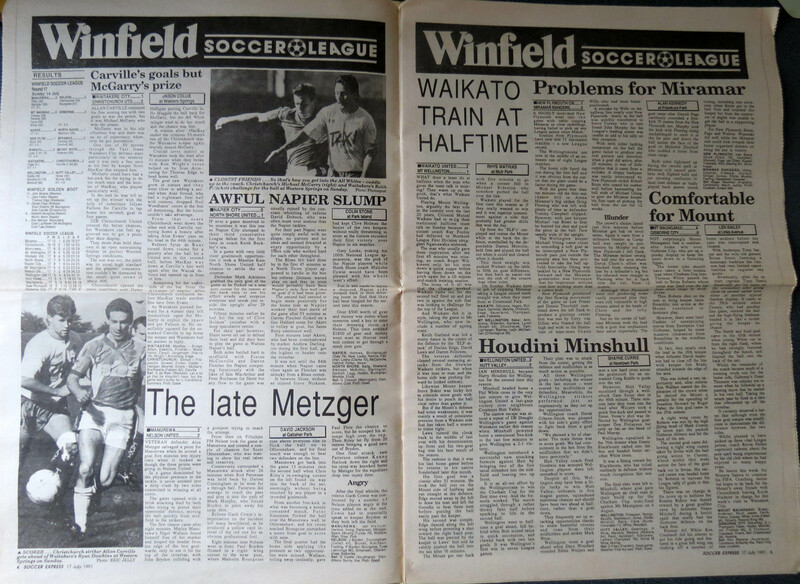 If you’re of a certain age you’ll remember that New Zealand once had a weekly football newspaper. Soccer Express it was called. One day recently I was sorting out all the crap in my garage and came across several boxes of old football mags. One rather large box was loaded with ancient issues of Shoot! which, unfortunately for them, didn’t maintain the sort of value that saved them from the skip. 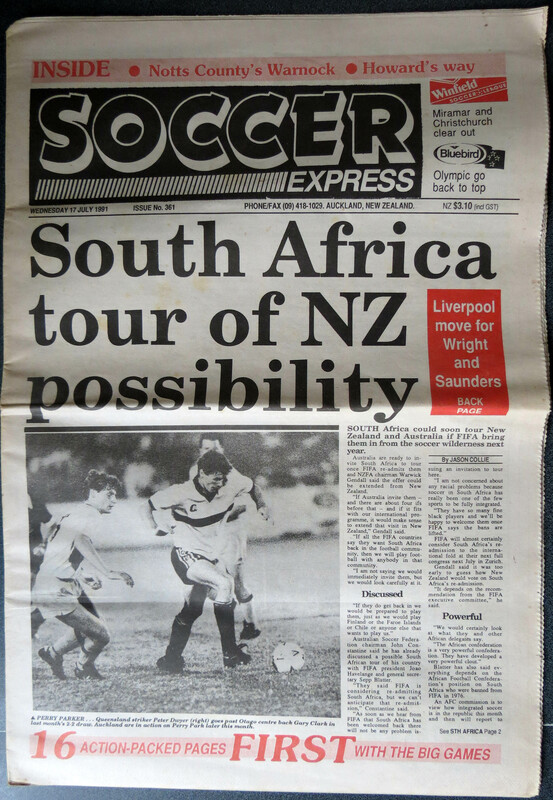 But a smaller box, tucked away in the back, contained my long lost collection of Soccer Express issues. It shows how long ago this issue came out because the tour was being mooted on the back of South Africa’s re-admittance to FIFA. As it turns out it took nearly 23 years for South Africa’s visit to be confirmed, which must be something of a record. Delving inside this issue, Acting Editor Terry Hobin congratulated five subscribers for winning a Mitre football and remembered the anniversary of the death of Tottenham Hotspur’s John White, a member of the 1960/61 double side, who was killed by lightening on the golf course in 1964. 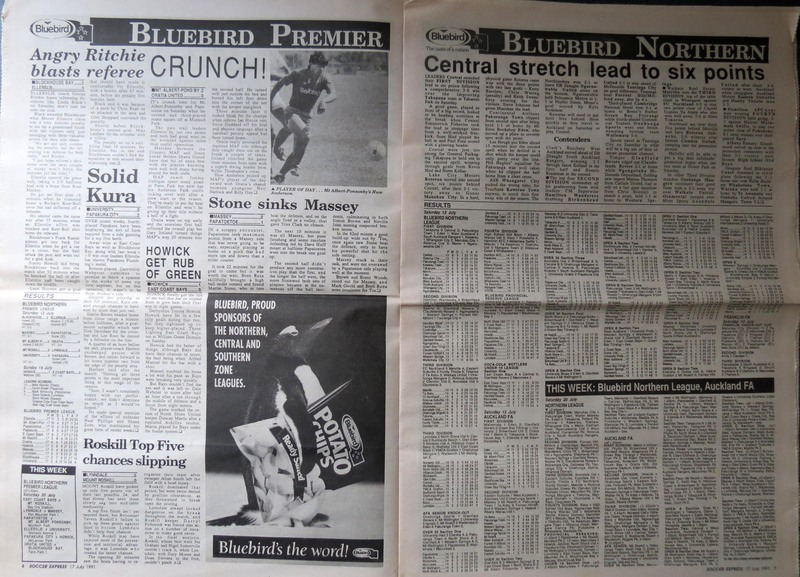 Several short articles filled pages 2 and 3, including an interview with New Plymouth’s Mark Donoghue whose side had just set a record for consecutive national league defeats of 11 games. Flicking through to pages 6 and 7 we get to the Northern League summary (click the image below). 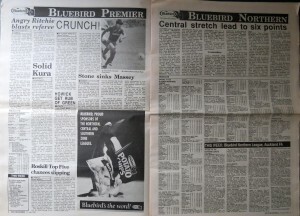 Have a read of the Bluebird Premier League reports and see if you recognise any names. If you have a look at the slightly jumbled tables in the results section you’ll see that below the Premier League there were a further four divisions. Fascinatingly for me, those four division contained no less than 18 clubs from my region, what is now know as WaiBOP… 18 clubs! In the rest of the issue there are somewhat smaller sections dedicated to the other regions around the country, a couple of full page ads, some space fillers from the UK and coverage of 1991’s Copa America. The back page contained news of Dean Saunders signing for Liverpool in a British record deal of 2.9 million pounds. There was also news of Paul Gascoigne being arrested outside an Italian restaurant in Newcastle. The first round draws for the European Cup (this was long before the Champions League appeared on the scene), the Cup Winners’ Cup and the UEFA Cup were also printed. I’ll dive into my Soccer Express box from time to time over the course of the season. Who knows what will turn up next? Hello I came across this article . You mention a interview with mark Donoghue on pages 2 and 3 . Mark was my older brother but he sadly passed away in 2011 . I would love to get this article for my dad ,it would mean the world to him . Any Chance ? Hi Sue. Absolutely. I’m away for Easter so will send it to you when I get back home. Hi there, I am always looking for articles featuring my late Father, Terry Conley, I was wondering if there are any articles in the Soccer Express editions you have? I remember looking forward to reading this every Wednesday! The good old days! Hi Todd. I’m sure there will be but I’ve got quite a big box of mags to wade my way through 🙂 It’s certainly nostalgic looking back to the Soccer Express days. A publication like that is pretty much obsolete these days, but I reckon an online version (minus all the overseas filler stuff) could work. The local game still gets pretty poor coverage so who knows, we may see a soccerexpress.co.nz one day! would be great to see some of these old Soccer Expresses…used to buy and enjoyed reading it – keep them coming please!